Letter from Rev. Robert Deans of Crailing, concerning his wife, whose respiratory condition seems to be improving. He notes in a postscript that she has had a sore throat for several years (see Doc ID 1703, 12 July 1779), and constant hoarseness for the past year. 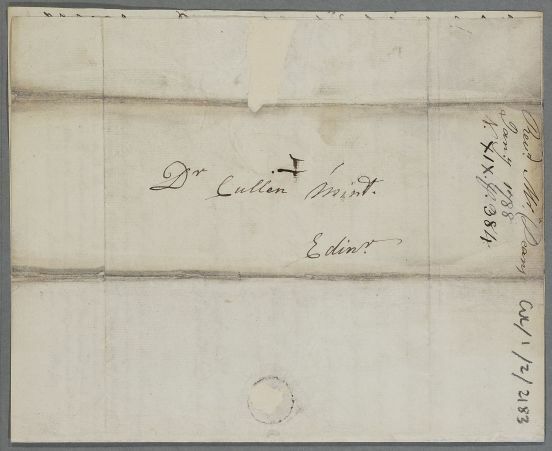 He also thanks Cullen for 'your friendly Attention to our Nephew', Dr Smith, who 'has been laying in a stock of Health, very needful before he go to American-Georgia' and who 'in a few days proposes to be anatomizing in London'. Summary Letter from Rev. Robert Deans of Crailing, concerning his wife, whose respiratory condition seems to be improving. 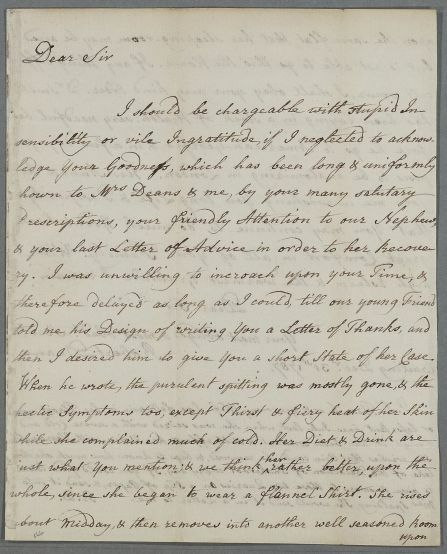 He notes in a postscript that she has had a sore throat for several years (see Doc ID 1703, 12 July 1779), and constant hoarseness for the past year. 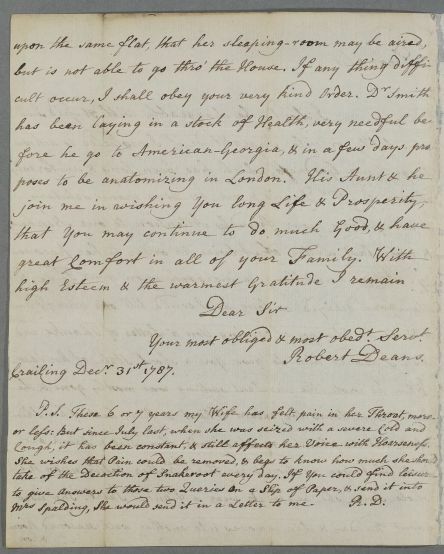 He also thanks Cullen for 'your friendly Attention to our Nephew', Dr Smith, who 'has been laying in a stock of Health, very needful before he go to American-Georgia' and who 'in a few days proposes to be anatomizing in London'. then I desired him to give you a short state of her case. Cough, it has been constant, & still affects her Voice with Hoarseness. Mrs Spalding, She would send it in a Letter to me. Your most obliged & most obedt. servt.